Yellow-crowned Bishop, Range-change map between SABAP1 (1987-1991) and SABAP2 (2007-current). Blue, dark green and light green = cells with very large, large and small relative increases. Cells = quarter-degree grid cells; Only cells with at least 4 checklists in both SABAP1&2 shown. All cells had this species recorded in SABAP1 or in SABAP2 or in both (more about interpretation at Biodiversity Observations 7.62: 1-13). 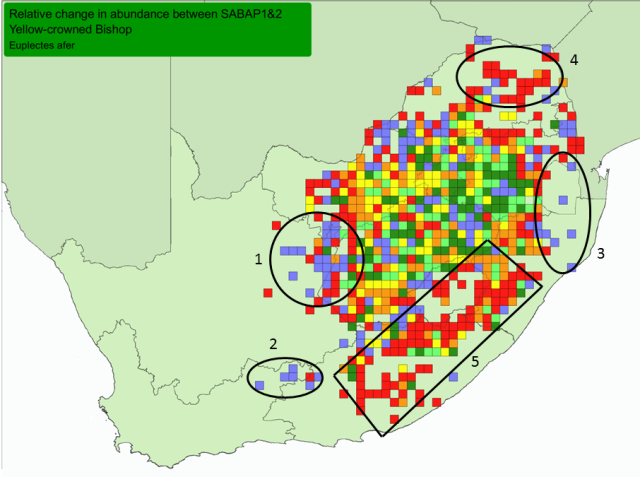 In South Africa the Yellow-crowned Bishop has more grid cells with decreases in reporting rate than cells showing increases, between SABAP1 (1987-1991) and SABAP2 (2007-). The points below match the points on the map above. 1. Western Free State extending into the Northern Cape. 2. Western part of the Eastern Cape - range expansion westwards towards Beaufort West. 3. Swaziland and northern KwaZulu-Natal - new out of range records. 4. Most of Limpopo Province. 5. Southern KwaZulu-Natal and most of the Eastern Cape. The greatest changes appear on the edges of its range. This is not too surprising as this species is somewhat nomadic, depending on ephemeral wetlands. Zimbabwe: movements in relation to dry conditions (Baker 2012b). Exotic populations established in foreign countries, especially Spain and Portugal, also Hawaii, Jamaica, Japan, Puerto Rico: Appendix of Dyer EE, Redding DW, Blackburn TM. 2017. The global avian invasions atlas, a database of alien bird distributions worldwide. Nature Scientific Data 4 no: 170041.